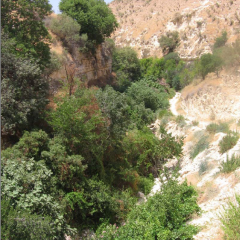 The selection of a model habitat for the Riparian Freshwater Habitat at the Royal Botanic Garden in Tal Al-Rumman was not an easy task. There was no question of attempting to locate an intact, natural freshwater habitat in a region as arid as Jordan. Wherever water exists in the country, it is intensively used by people, usually for agriculture and as a hub of human settlement. 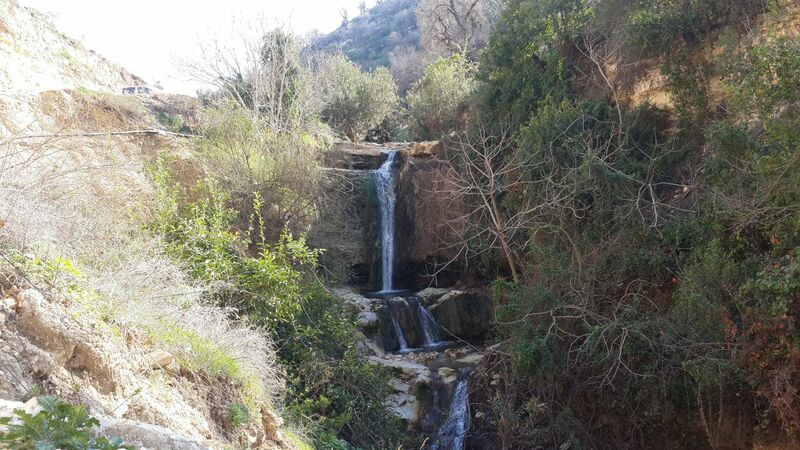 The RBG team determined to look for a habitat that fit the following profile: a perennial stream flowing north at an elevation of 150 to 250 m above sea level, with surrounding geology similar to Tal Al-Rumman, and as much native biodiversity as possible. 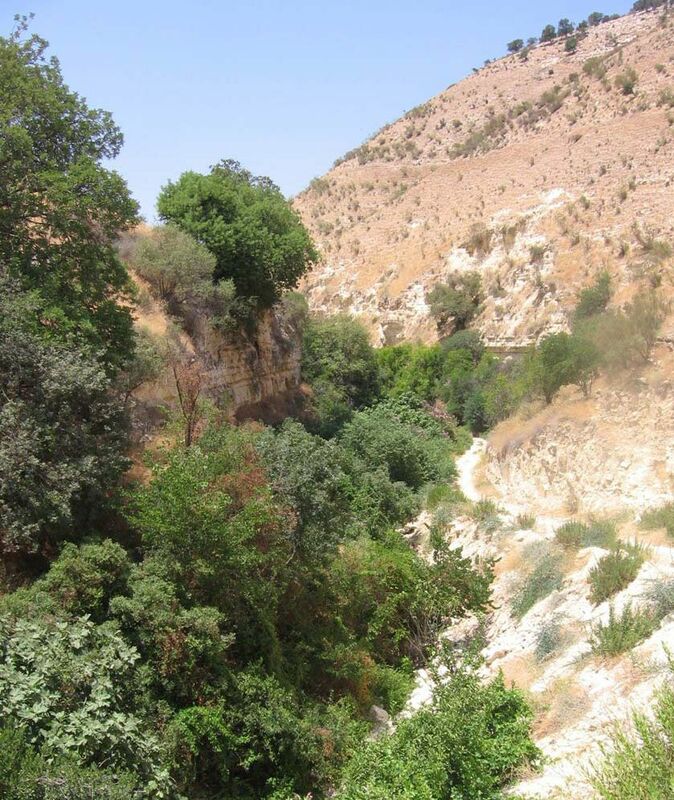 After considering several wadis, the team selected Wadi Atiyyah in the Yarmouk Reserve as the model, or home habitat, for our Riparian Freshwater Habitat. 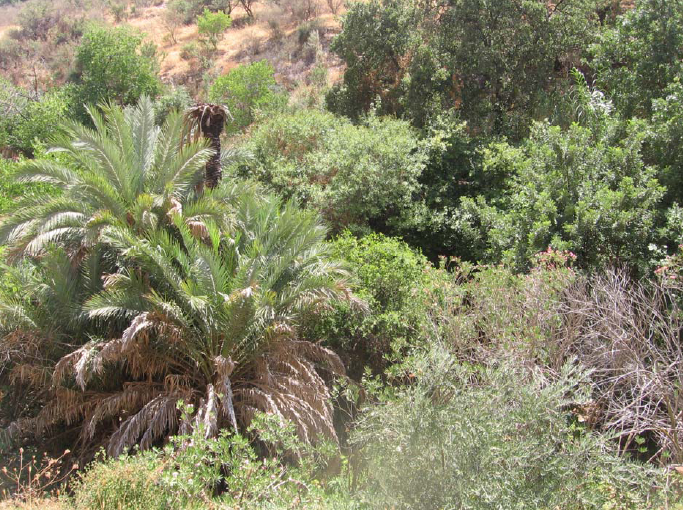 In addition to fitting the profile, Wadi Atiyyah may have the largest Ceratonia siliqua, or carob, community in Jordan. As expected, there is farming along its length, although relatively informal. 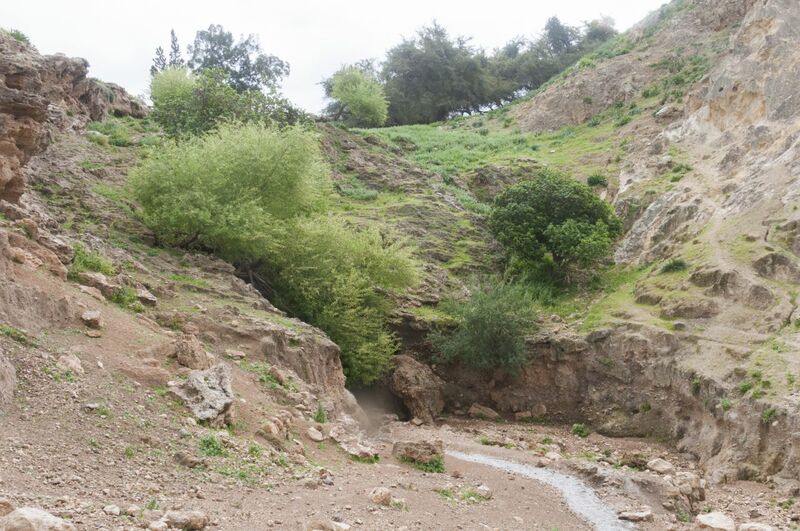 Figs, date palms and olives are found near the stream bed, but these are densely overgrown with native species. Here are the main wild plant species that have been recorded in the area: Salyx alba, Populus euphratica,Styrax officinalis, Nerium oleander, Dittrichia viscose, Phragmites australis and Rubus sanguineus in the water. Zizyphus lotus, Quercus ithaburensis, Ceratonia siliqua, Platanus orientalis, Capparis spinosa, Eruca sativa and Ruta chalepensis on the banks. In Wadi Rumman, as in Wadi Atiyyah, the east slope is barren. Although nominally protected as part of the watershed buffer for the King Talal reservoir, in fact it is as severely overgrazed as the Royal Botanic Garden once was. The RBG is now making every effort to protect the stream bed, but as long as the eastern slope remains bare, it will serve as a stark illustration of the difference between managed and unmanaged grazing lands. Click here for a list of the main plant species to be included in the Freshwater Habitat at the Royal Botanic Garden. More information on some species is available below. In the gallery below, you'll find pictures and information for some of the plant species in our Freshwater Habitat. Our future depends on the biodiversity in our ecosystems! 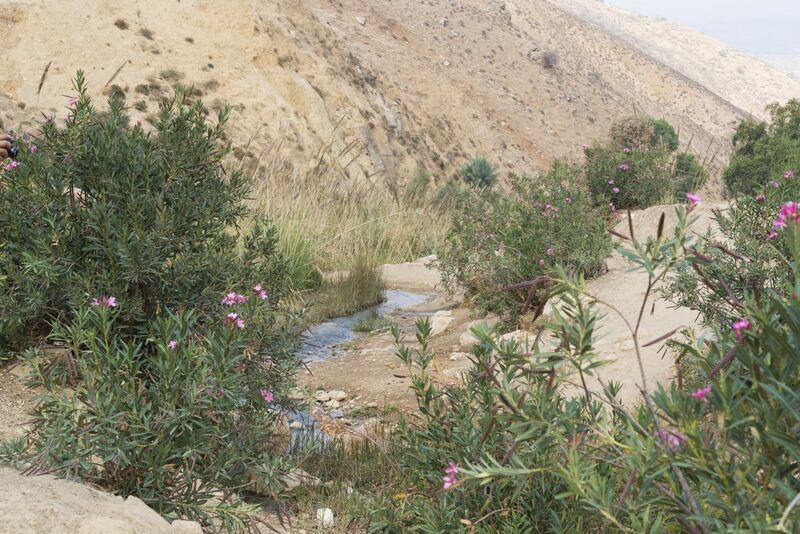 Jordan's wadis are a source of fresh water and abundant life in an otherwise hot and arid environment.